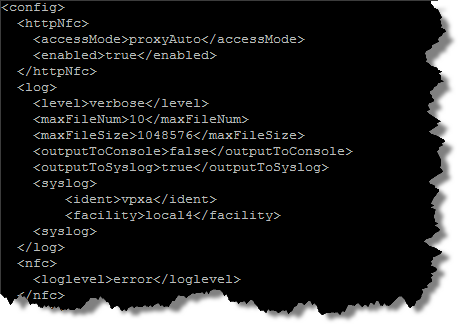 I recently received a question about whether it was possible to configure Active Directory integration with vMA. Out of the box, this is not a feature that is available by default but can be set up. There are many articles online that provide instructions on configuring AD integration on UNIX/Linux host but they may not always be as straight forward to implement. While pondering about this question, I remember reading an article about the OEM partnership between Likewise and VMware, in which Likewise's authentication software will be integrated into future releases of the vSphere platform. There has also been rumors that the Likewise software will be appearing in the next release of vSphere which may provide AD integration out of the box. Likewise has an open source product called "Open" which integrates with UNIX, Linux and Mac systems to Microsoft Active Directory, allowing users to authenticate with their Windows domain credentials. I thought it would be interesting to see if I could get "Open" running on VMware vMA and surely it was pretty straight forward. 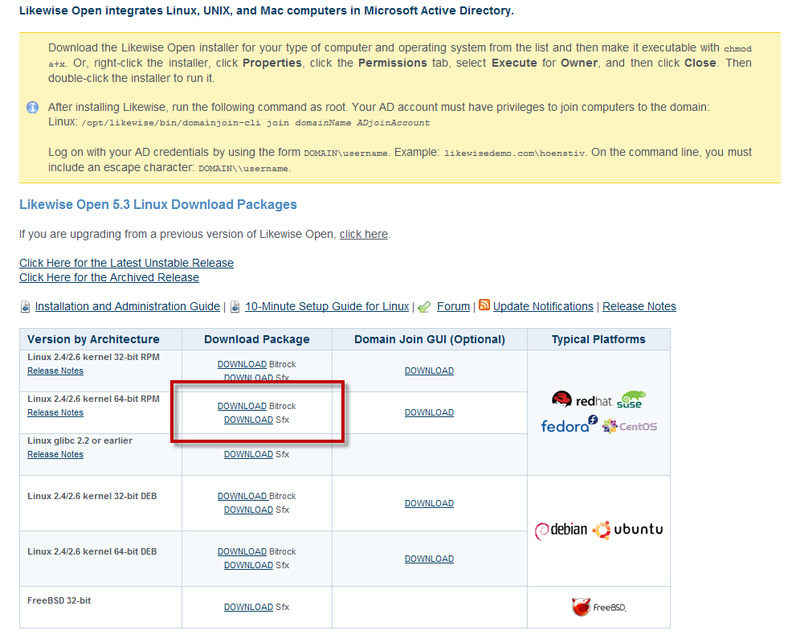 Note: Make sure you select the 64bit version and the non-GUI version of "Open". 2. You will now upload the installer LikewiseIdentityServiceOpen-5.3.0.7798-linux-x86_64-rpm-installer to your vMA host using either UNIX/Linux scp or WinSCP if you are on a Windows systems. Welcome to the Likewise Identity Service [Open] Setup Wizard. agreement before continuing with the installation. Should the 32-bit compatibility libraries be installed? These are only needed if 32-bit programs will be accessing the Likewise authentication code. If you do not know the answer, just leave it as "Auto". Setup is now ready to begin installing Likewise Identity Service [Open] on your computer. Please wait while Setup installs Likewise Identity Service [Open] on your computer. change "login-shell-template = /bin/sh" to "login-shell-template = /bin/bash"
6. Before we join the vMA host to the Active Directory server, ensure that DNS is properly configured and that both forward and reserve lookups are correct on the vMA host. 189.0.30.172.in-addr.arpa domain name pointer kate.primp-industries.com. 7. We will now join the vMA host to an AD server. The syntax will be "domainjoin-cli join [domain] [username]"
applications recognize the new settings. known modules. Please email Likewise technical support and include a copy of /etc/pam.conf or /etc/pam.d. 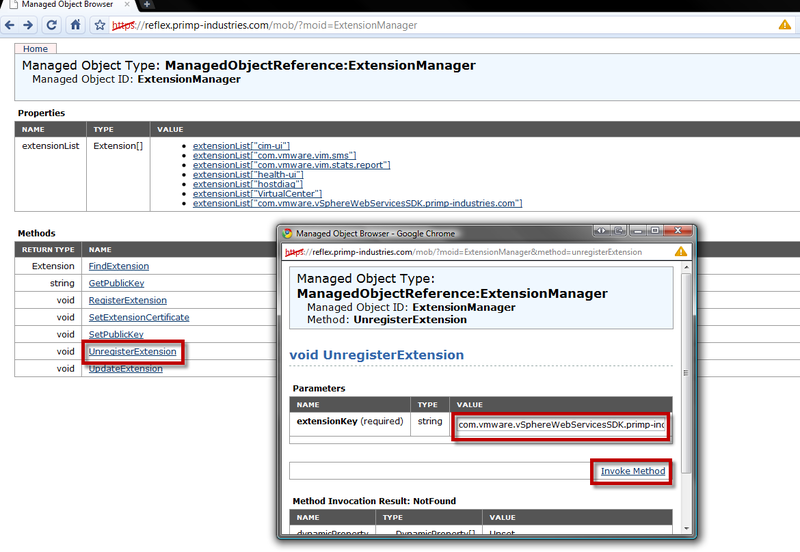 Even though the configuration of 'pam' was executed, the configuration did not fully complete. Please contact Likewise support. Note: Do not worry about the warning message, it is normal and you do not need to restart the system for the changes to take effect. Configuration successfully loaded from disk. run 'vma-help' or see http://www.vmware.com/go/vma4 for more details. [N]ecessary - this step must be run or manually performed. All Likewise utilities are installed under /opt/likewise/bin and for more information on these utilities and how to use them, check out the Likewise documentation here. 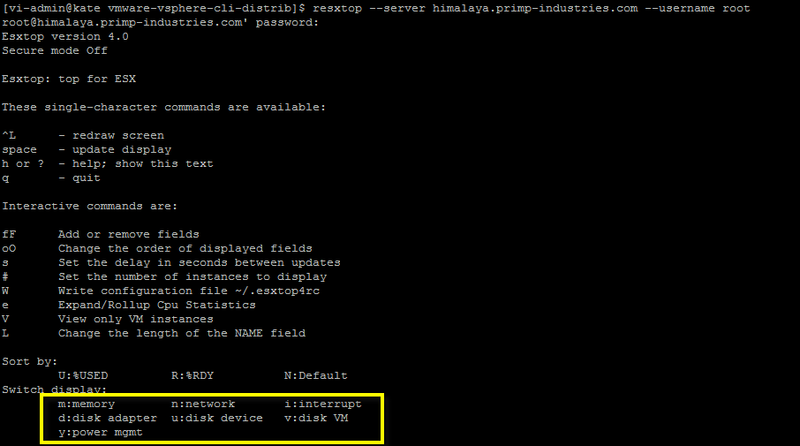 The instructions above can also be used to setup "open" on classic ESX w/Service Console, ESXi will not work however. Is vSphere 4.1 release really imminent? There have been a few articles floating around web regarding the potential features and speculations on when the next version of vSphere will be released. While doing some research on a new article that I am working on, I stumbled onto an interesting VMware website, called VMLive. VMLive is VMware's interactive webinar series designed specifically for their partner community. 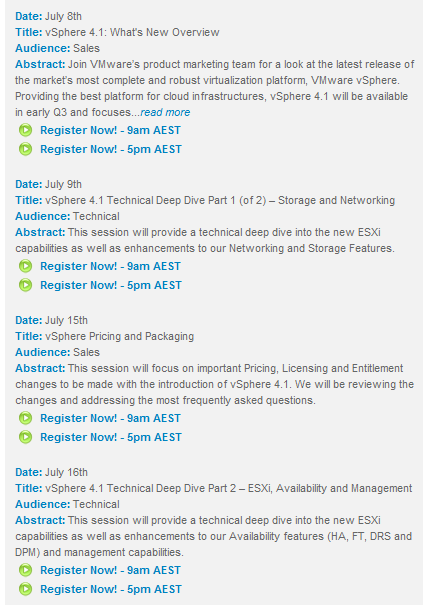 It seems that Australia-New Zealand VMLive channel is getting a head start on next release, which looks to be vSphere 4.1! I'm curious if other regions are getting similar offerings? Here is the link, assuming it does not get pulled. There was a question today on the VMTN forums about obtaining the latest version of resxtop for vMA to utilize the new NFS datastore counters. Unfortunately, there is no automatic method of updating vMA to get the new version of resxtop, which is part of the vCLI 4.0 Update 2 package. The current release of vMA 4.0 contains the GA release of vCLI 4.0 (May 2009). 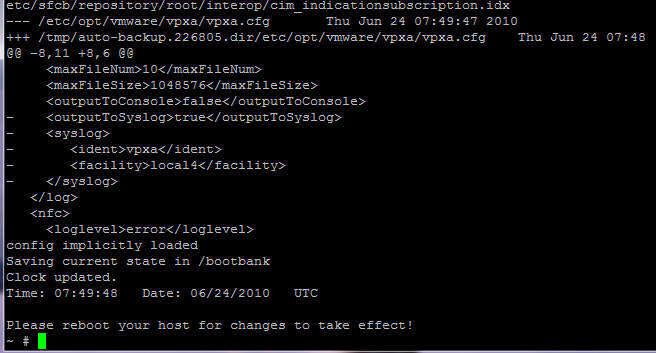 VMware has since released both and Update 1 and Update 2 of vCLI. Even though there is no automatic way of upgrading the vCLI on vMA, it is actually pretty easy to download the latest version and upgrade it yourself. Before starting, you will want to download vCLI 4.0 Update 2 and ensure that it is the 64bit version. A previous installation of vSphere CLI has been detected. Removing installer DB, please re-run the installer. After this, you now have the latest version of vCLI 4.0 Update 2 installed on your vMA host. The biggest feature with this new release of the vCLI is the NFS datastore metrics which has been a sought after for awhile. One other feature that has not gotten too much attention in the new version of esxtop/resxtop is the power management metrics, denoted by the new "y" option.